Last night, my family and I went to see Moana. We've been wanting to see it since we saw the first teaser trailer last year. Obviously, as a resident Disney addict, I go to see every Disney movie when it comes to the theater. There wasn't a dull moment in the whole movie. There were times I was sitting on the edge of my seat wondering what was going to happen next. Moana was a fearless teenager who didn't let anything stand in the way of saving the people of her island. She was resilient and even bossed around Maui (the demigod!). I appreciated the relationships in this movie, as well. 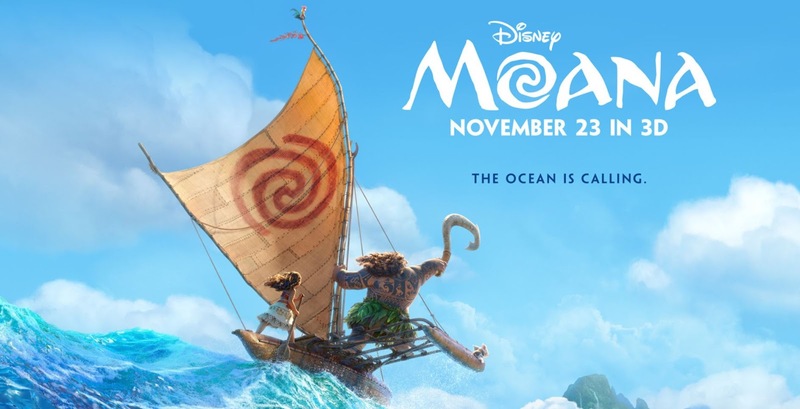 Moana, although she respected her parents, wanted to be able to get out on her own and live her life (outside of her small island), despite her parents wanting her to stay where she was, safe on their island. This was a typical good versus evil movie, one that I found satisfying from the very first minute to the closing credits. Like I said above, Auli'i Cravalho is a newcomer to film. She was so good at the part of Moana that I was thoroughly impressed that she'd never done any voice-over acting before. Dwayne Johnson voiced Maui, the demigod. His character reminded me a lot of him, and he never failed to make me laugh. I would give Moana a 10/10 rating! The plot, the voice cast, and the music made this animated film a special treat for the whole family. Have you seen Moana? If so, what was your favorite part? If not, when are you planning to see it?